Good sleep. Listened to General Conference. Went on a walk with the kids. Took a nap. A.M. Started with 4 with Hyrum in 35:33. 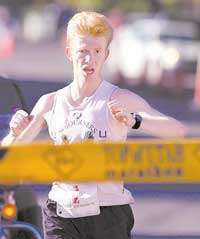 He needs volunteers for the Utah Valley Marathon on April 12th. Call him 472-7866 if you would like to help. Then continued with 11.1 more at around 7:30 pace until it started hailing. Then picked it up to 5:30 for a quarter (1:22). It stopped hailing. I backed down to 7:30. Then it started hailing again. I began to wish I had not backed down, I would have already been home. Picked it up, ran the last 0.35 at 5:20 pace, timed the last quarter in 1:20. 1:56:56 for 15.1. P.M. 2 miles with Benjamin in 16:14, then 3 more pushing Joseph in the stroller to Albertsons, and then a long detour back home to make the distance goal. A.M. 15.11 in 1:56:34. First 12.11 with Jeff and Josse. Did my standard post-VPB speedwork. 0.25 in 1:23, 0.1875 in 59, and 0.3125 in 1:40, total of 0.75 of unplanned tempo running. P.M. 2 with Benjamin in 14:22. A devil got into him, and he made me run my fastest continuous mile of the day in 6:56. Ran 3 more in 22:21. A.M. 10.1 with Jeff in 1:19:55 at 5:10 AM. Aerobic hibernation. The Crocs have made past the 50 additional miles demise point predicted by Josse on Sunday. Still no hole. And they weigh only 3.9 ounces. Vibram Five Fingers weigh 6.2! P.M. 1.5 with Benjamin and Jenny in 12:56, 0.5 more with Benjamin in 3:42 (16:38 at 2 miles), 1 with Julia in 10:40, and 7 mostly alone (a couple of miles with Derek who I found on the trail running home from work) in 50:56. Did a couple of pickups. A.M. Ran with Jeff and Brad. We did our regular hibernation run, except Jeff wanted to shake his legs at 5 K race pace since we are running one this Saturday (Utah Valley). Well, we got carried away on those. I think Jeff just wanted to burn a hole in my Crocs. Our first quarter was 69 instead of planned 75. Our second was 67. On the third one a devil got into Jeff and he hit the first 200 in 31. As if that was not fast enough, he sped up and dropped me. I caught a split of 46 at 300 and complacently eased off to finish in 64. Jeff ended up with 59! Dropped Jeff off at 10.1, dropped Brad off at 12.1. Ran another 3 miles. Total time for 15.1 was 1:56:48. P.M. 1 with Julia in 11:20, 1.5 with Jenny in 13:20, 0.5 more with Benjamin in 3:36, and 2 more alone in 15:22. A.M. Jeff was sick this morning with a cold. So I ran alone. Took it easy. Ran about 7:20 - 7:30 pace for 12.5 miles. Then a biker with a dog was catching up to me, and I began to wonder how fast I would have to run for them not to pass me. Turned out that about 6:50 pace was enough to hold them off, and then they stopped anyway. But I was already in gear, and figured since I had only 2 miles left, I'd be OK. So I just ran that pace to the end. 1:49:58 for 15.1. The Crocs are on the verge of developing a hole, there is a small crack on the right one, but I cannot yet feel the asphalt. P.M. 1.5 with Benjamin and Jenny in 13:16. 3.5 with Jeff later in 27:40. A.M. Woke up this morning at 3:00 AM to go to the bathroom and then could not fall asleep. Oddly enough was worried about Steve getting lost on the course again and getting a bummer instead of $1000. After about an hour of wondering I finally decided to call Hyrum (figuring he was up setting up the course anyway) and make sure everything is OK. Hyrum reassured me everything was fine, but by then I was wound up enough that I could not fall back asleep. Had a bit of an adventure at the start with Jeff not realizing the race was chip-timed and not bringing the chip. We finally got his chip, but that gave us only 0.5 warmup in 27 F weather. With me not getting enough sleep, Jeff fighting the cold, and neither one of us getting a good warmup for such a short race it was lame racing the lame. So we did our best under the circumstances. Traded leads every minute through the first mile, then I took my lead and Jeff fell back. Caught 4:39 split at 24 mile marker of the marathon, which is 5:14 pace. Got 9:55 at mile 25 marker, 5:16. With about 0.5 to go Jeff made a strong move, and caught, and passed me. I latched on to him, but then he started the kick and gapped me. 15:14 at mile marker 26, 5:19. I closed a bit half way through, but not enough, and then he opened up what I closed again. We ended up 1-2, Jeff 16:19.7, me 16:20.9. The course was flat, the last 5 K of the marathon. I would say the time was acceptable for the lack of sleep, the cold weather, and the lack of warm-up. Paced Benjamin. He ended up with 21:32.2 running in Crocs, a PR by 28 seconds. Then drove to around mile 18 and paced Steve from there. Steve won with 2:37:08 with a gap of over 19 minutes in spite of having a cold. Then paced Andy, he got a decent time for a training run - 3:02. Then paced Josse, and watched her move into the lead on the last mile performing the proverbial lamb sacrifice as she moved into big money and left her opponent with none. Then ran some more with Jeff back to where we left our cars. Ended up with about 18.4 miles total. P.M. 1 with Julia in 11:20, 1.5 with Jenny in 13:04.